AMROTEC X-1 — C&A Associates, Inc.
X-1 is one of the world’s most compact currency discriminators with a dedicated reject pocket. It is equipped with Smart & most comprehensive user-friendly functions for front bank tellers and retail cashiers. With an ergonomic design, 3.5″ large color LCD, and symbolic user-interface, the X-1 not only provides users trouble-free operation, but also allows uninterrupted counting with increase productivity that all customers desire. X-1 also reduces operation noise by 10dB than competitors making it to be the quitest machine in the market since 2013! Unique Clamshell design, shorter bill-path (205mm) than competitors with must needed 12 Roller shafts to provide smooth banknote transporting and neatly stacking while allowing easy access to bill-path and quick jam removal experience for users. First of it’s kind, X-1 provides users option to choose from Relaxed version or Strict version USD software as to bill suspect detection and bill read rate. User-friendly interface allows users to remove unnecessary counting mode from the machine for simplicity. 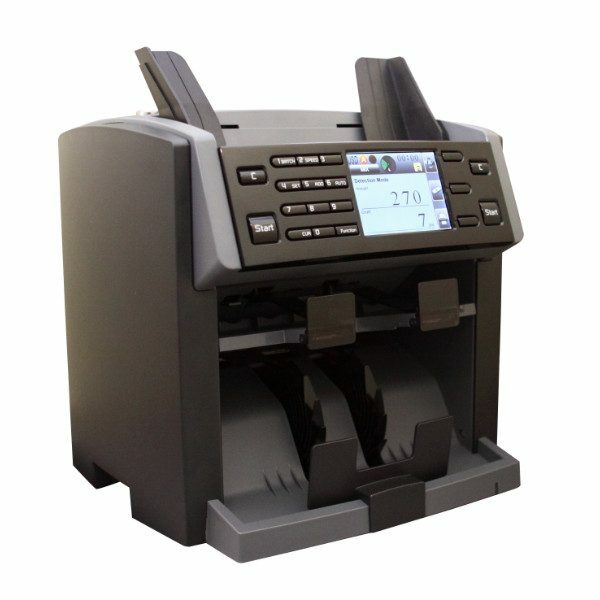 While smallest foot-print allows space savings, unique Dual-user feature allows 2 tellers to share a single machine with single printer. Unlike some comparable machines in the market, X-1 eliminates slow reaction from control panel keys by years of engineering improvement.